While the certainty provided by an election outcome has been positive for the stock market over time, our positive stock market outlook is based much more on fundamentals. It does not get more fundamental than earnings, which are on track to grow by 10% year over year for the second straight quarter. Earnings season is not over, but with about 90% of S&P 500 companies having reported results, we are ready to declare it a success. The market's focus was clearly on the midterm elections last week (November 3 - 7) with the Republicans taking control of the Senate - as expected - and adding to their majority in the House. While the certainty provided by an election outcome has been positive for the stock market over time (as we wrote in our September 2, 2014, Weekly Market Commentary: "Midterms May Mean More Gains for Stocks"), our still positive stock market outlook is based much more on fundamentals. It does not get more fundamental than earnings, so this week we provide a wrap-up of third quarter earnings season. If you have young children, spelling is always on your mind. In that spirit, this quarter we present our earnings recap using E-A-R-N-I-N-G-S as an acronym. In the interest of time, we have chosen not to do the A-B-Cs of earnings season and comment on 26 topics. Truth be told, we were scared off `by the letter X.
E - Energy. The elections do not impact earnings enough in the near term to be worth a letter. Instead, energy is the choice, after the sector suffered the biggest reduction to current quarter estimates (Q4 2014) among the 10 equity sectors. 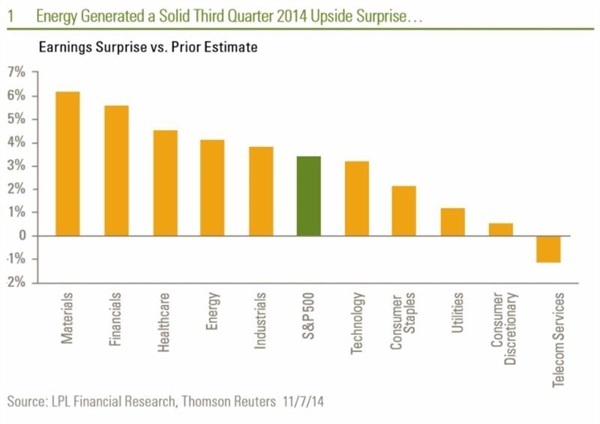 But in perhaps the biggest surprise this earnings season, the energy sector generated a solid upside surprise to third quarter earnings relative to expectations, as of October 1, 2014 [Figure 1], and matched the earnings growth rate of the S&P 500 at 10% on strong performance for refiners that have benefited from lower cost oil [Figure 2]. Corporate America has managed another E - Europe - quite well, as we discussed in our Weekly Market Commentary, "Corporate Calm" on September 27, 2014. (Incidentally, another E - Ebola - also has been well contained and caused only minor disruptions to travel-related businesses that have reported results). A - America. The strength of America relative to rest of the world stood out this earnings season. While many companies highlighted the slowdown in Europe, you would be hard pressed to find a major global company that saw weakness in America. Not only did companies benefit from strength in the United States, they managed slower growth in Europe effectively and generated the typical amount of upside to third quarter earnings estimates of 3 - 4%. Corporate America's ability to manage costs, sustain profit margins, and maintain strong balance sheets has also continued to impress, and we do not expect those conditions to change anytime soon. R - Revenue. The third quarter is on track for another quarter of 4%-plus revenue growth despite a 2.6% decline in energy sector revenue. Revenue received support from continued steady business spending (or if you prefer, another R-reinvestment) and roughly matched nominal growth in gross domestic product (GDP), as it has tended to do historically. The resilience (another R) of earnings estimates is another positive this earnings season, which we discuss under N below. N - Negative revisions are normal. Negative revisions to forward estimates are in-line with historical averages. Consensus forward estimates (next 12 months) for the S&P 500 have fallen only 2.5% since October 1, 2014. We consider this a positive result - should it hold for the last 60 or so S&P 500 companies left to report - because it could have been much worse due to the drags of sharply lower energy sector estimates, the strong U.S. dollar, and lackluster growth in Europe. I - Industrials. Along with the resource sectors, which fell along with commodity prices, industrials was among the worst sector performers during the month leading up to earnings reporting season. The industrials sector has largely put any earnings doubts to rest with solid earnings growth (12%), a 4% upside surprise versus prior estimates, the best earnings beat rate among all 10 equity sectors (86%), and the second most resilient earnings estimates for the current quarter (Q4 2014). This performance is particularly impressive given the sector's heavy exposure to Europe and falling foreign currencies. Investors have apparently been impressed, as the sector has led the rally back from the mid-October lows [Figure 3]. We should also note another I - the Institute for Supply Management (ISM) Purchasing Managers' Index (PMI) - came in at a very strong and better than expected 59 for October 2014, which bodes well for earnings over the next six months [Figure 4]. A PMI reading above 50 percent indicates that the manufacturing economy is generally expanding; below 50 percent indicates that it is generally declining. N - Noise. The list of things the market was concerned with in late September and early October was a long one, including countries (China, Iraq, Syria, Russia, Ukraine), regions (Europe), militant groups (Islamic State), and diseases (Ebola), as well as the more common worry - stock market valuations. Though this list includes deadly conflicts and diseases in which lives have been tragically lost, for the stock market the bottom line is that the earnings impact of each threat has been marginal. That could change, but the latest mostly earnings-driven rebound in the stock market serves as a reminder that much of what we hear on the news is noise for investors, and that earnings are the bottom line. G - Growth. Earnings are on track to grow by 10% year over year for the second straight quarter [Figure 5]. Excluding the Bank of America regulatory settlement, growth would approach 11%, which would mark the fastest earnings growth since the third quarter of 2011. Six sectors are poised to generate earnings growth at that 10% mark or higher, led by healthcare (the others are energy, financials, industrials, materials, and technology). Despite the estimate reductions, the consensus still expects earnings to grow 8% during the current (fourth) quarter and for the full year 2014 (consensus for 2015 now stands at 10%). Revenue growth exceeded 4% for the second straight quarter, which hasn't happened since the fourth quarter of 2011 and the first quarter of 2012, despite the drag from a 2.6% drop in energy sector revenue [Figure 6]. S - Slowdown overseas. The slowdowns in Europe - and to a lesser extent, China - were among the most important questions coming into earnings season because of the sizable revenues earned by U.S. companies in these markets (estimated 20%). Those questions have largely been answered positively by corporate America, with solid earnings and revenue performance and relatively modest negative revisions to estimates, despite slower growth in two of the most important regions of the world. A prolonged recession in Europe remains a risk, though lessened by the actions of the European Central Bank (ECB), as does a hard landing in China. But based on commentary from management teams these past few weeks, neither slower growth in Europe or China is likely to materially slow the solid earnings trajectory. Also worth noting is that while earnings in Europe have grown at a similar rate as the U.S., European earnings have missed expectations compared to the solid upside surprise delivered by the S&P 500. And European revenue was flat year over year during the third quarter (based on the STOXX 600). We are big believers in earnings as the most fundamental driver of stock market returns. Third quarter earnings season is not over, but with about 90% of S&P 500 companies having reported results, we are ready to declare it a success. Despite the midterm elections grabbing most of the headlines last week and the positive signal that provides for stocks historically, we believe strong earnings have been the bigger driver of recent stock market gains. Policy may help provide support for corporate profits in the long run, but corporate America right now does not need much help.